Oh, that's right up my alley! Cute, adorable, pugalicious. 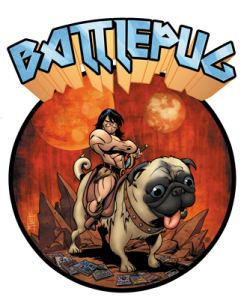 "Battlepug" is an online, beautifully drawn and colored "illustrated novel" (in the old days we called them "comics"). It began just a few days ago and involves a story about...well, battlepugs. It features a cute pug, a snarky-sounding French bulldog, and--in the first and second chapters--a most bodacious naked gal in bed. Naked Gal is telling a story to the two dogs, Scheherezade-style, a little at a time. Illustrator and writer Mike Norton puts puts out a new chapter each Monday, and it just began February 14. 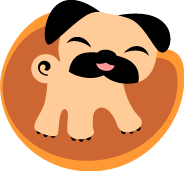 So go to Boodapug and enjoy some of the cutest pug pictures ever. Then run over to Battlepug and enjoy the most amazing, lush illustrations and oddball story line ever. Just watch out; if your 13-year-old nephew sees this, you'll be wiping lick marks off your screen. Budalicious, indeed!!! 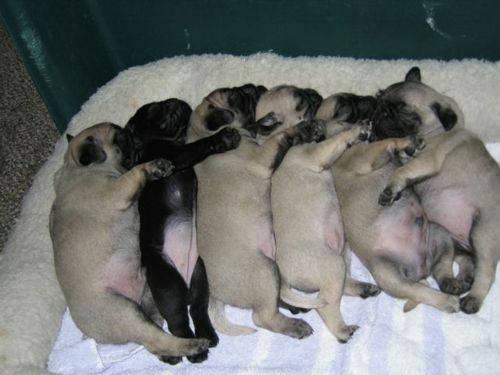 SO MANY cute, little round tummies all in a row - just waiting to be rubbed!